Next time you go to Morocco, look up French Montana's uncle. He played quite a host to photographer Michael Schmelling and writer Zach Baron as they accompanied French on his return to the country of his birth, which he had not visited since he left as a teenager. French himself was wildly hospitable, and we're happy to announce our new issue with him as cover star. Sharing that honor with him is Australia's Tame Impala, who are certainly one of the best rock bands in the world. We literally went to the end of the earth (Perth) to find them. We traveled to a lot of places around the globe for our annual Photo Issue, looking at life at home in Russia, women in Saudi Arabia, and new music in Egypt, with pit stops in Jamaica, Germany, France, Japan, Ghana, South Africa and more along the way. 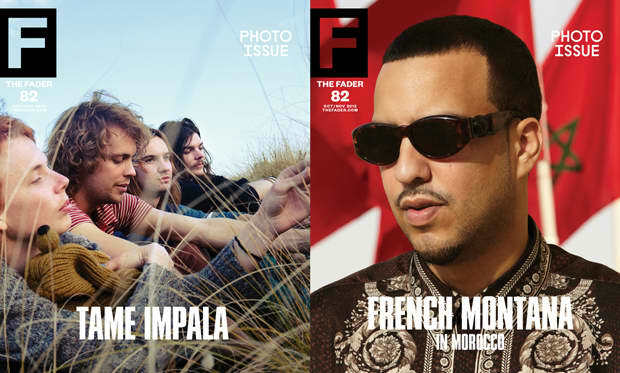 FADER #82 hits stands October 9th, but you can read our cover story French Montana right now.